This is such a fun foot toy! Our parrots love all the porcupine shapes, the texture is probably what intrigues them and they really enjoy pulling the pieces off (make sure yours doesn't actually consume these rubbery parts). So we've made this fun little "life's a beach" type toy, looks like he's surfing and enjoying the sun, doesn't it? It's so simple to make with a couple of ParroRings, smiley face, clothes peg and bamboo slat! We have all the parts available so you can save some money and make your own toys or buy it already made! 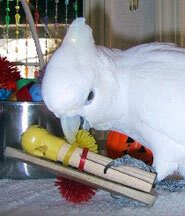 Either way, it'll put a smile on your parrot's beak when they get to play with this toy! 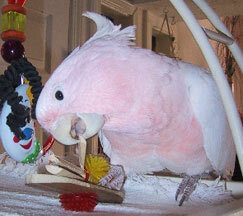 Cali, Ducorps Cockatoo pictured above left, loves those ParroRings and Major Mitchell Cockatoo, Ohana, pictured above right, is turning her toy into toothpicks (note: she has a musical moon to work on next)!